George Springer is the leadoff hitter for the defending World Series champion Houston Astros. He had three attempts of hitting for the cycle on Monday yet failed each time to hit a triple, but settled nonetheless for a spot in the record books of the team. 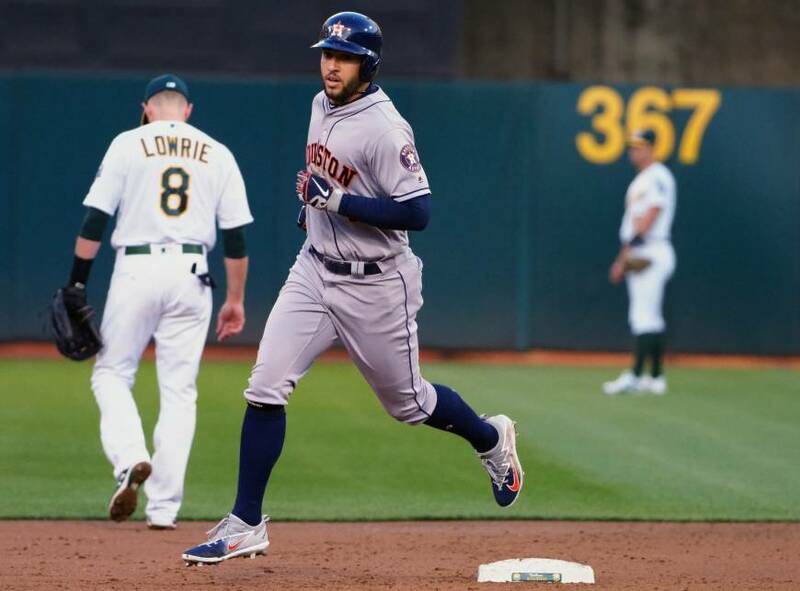 On Monday night, Springer ended up 6-for-6 on the night matching a record for the Astros as Houston routed American League West rival the Oakland Athletics 16-2. After the game, Springer said he could not explain it. He said he is happy when he has six hits in one week, let alone that number in a single game so he was speechless. Springer doubled to lead off the first inning; hit a towering three-run home run that traveled 462 feet during the second; and singled during the fourth. Although Springer came up short in his attempt to hit for the cycle he joined a club that was even more exclusive. During the history of Major League Baseball there have been 225 cycles hit, but six-hit games have been accomplished just 105 times counting Springer’s on Monday. Springer raised his batting average 28 points to .292 during the game and became only the second player in team history to finish the game 6-for-6 and the first to accomplish the feat in a game of just nine innings. Springer tied Joe Morgan the former Astros second baseman and Hall of Famer who went 6-for-6 on July 8, 1965 but in a game that was 12 innings long. Astros manager A.J. Hinch called Springer’s night remarkable, as usually a player rarely sees that number of at-bats during one game and to have that number of hits to different parts of the field and in different ways such as three singles, a double and home run is just remarkable. Springer received the ball from his last hit on the night in the ninth inning and told the media he would save it, as he does not think he will ever get six hits in the same game again.